Megalodonta beckii of Michigan Flora. Lakes, ponds, rivers, and streams. While the deepest recorded depth in Michigan is 4.6 m, this species flowers (and fruits) best in relatively quiet and shallow water. Though often recognized as the monotypic genus Megalodonta, the molecular phylogeny of Ganders, Berbee, & Pirseyedi (2000) strongly suggest that it belongs in Bidens. 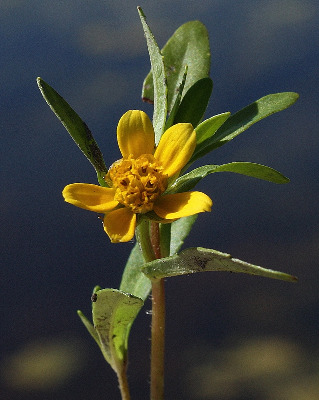 Though the heads are like other species of Bidens with ray flowers, the submersed foliage is often superficially confused with that of other dissected-leaved aquatics. The submersed leaves (opposite but branching at the base so appearing whorled) differ from those of Myriophyllum and Rorippa aquatica in lacking a central axis and in being much branched; from those of Ranunculus, Utricularia, and Rorippa aquatica in being opposite (or seemingly whorled), without bladders. The bushy appearance of the leaves surrounding the stem at the nodes, with bare internodes between, gives vegetative pieces, which are often seen washed up on shores, a distinctive tiered aspect (shared only with Utricularia purpurea). The simple, opposite, toothed emersed leaves are very different. MICHIGAN FLORA ONLINE. A. A. Reznicek, E. G. Voss, & B. S. Walters. February 2011. University of Michigan. Web. 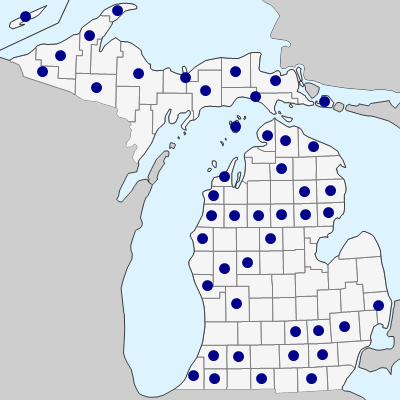 April 21, 2019. https://michiganflora.net/species.aspx?id=407.